Large open-plan kitchen/dining and lounge. Patio doors directly to pool terrace. Twin bedroom with bathroom. 1 double bedroom with large private terrace, and 1 twin bedroom, both overlooking the private pool below along with sea views. The lounge and all bedrooms are air conditioned. The Air Conditioned living room has sofas, WiFi Internet, DVD player and dining area. There are patio doors to the pool terrace along with sea views. If an additional bed is required there is 1 sofa bed. Villa Liakada can sleep up to 7 people. Wonderful views. Terrific villa. The village of Panormos was a great hideaway from Tourist hoards; the beach was sandy and lovely. We enjoyed the local tavernas especially the fresh seafood offered. Thank you. sehr schÃ¶n Wir hatten fantastische Ferien im einem sehr schÃ¶nen Haus mit einem sehr gepflegten Garten. very beautiful We had fantastic holidays in a very nice house with a very well-kept garden. We've never stopped in a villa before but after this experience we won't have anything other than In a villa. It is so clean, has every amenity you would ever need, a great location and the outdoor space too. We are booking again for next year. Panormo is so beautiful and this villa is an ideal place to stay. It has a BBQ, outdoor seating, indoor seating, a shower room and a bathroom, dishwasher, washing machine and everything in between!!! Please do not look any further than this villa. It is perfect. We are a family of five and it accommodated us perfectly. All the amenities you will need and a real homely feel. The village is beautiful and only a six minute walk away. The beach is closer and it has a lovely little taverna at the back of it. We are already looking to book to come back again next year. A dream villa. The Agni Team who we booked through over the telephone were very helpful. Our stay was amazing. We loved Villa Liakada perfect family stay especially if you prefer to be away from tourist places in more quiet and traditional part of Crete. It was only 30 mins drive to Rethymnon city. Sea front is just 2mins away from Villa. Views are gorgeous. Highly recommend to everyone. Did not have any problems with Agnitravel. Everything was great. Thank you so much. The villa, the setting and the village were great. the garden was very beautiful, lots of plants and grassed area, makes it nice and comfortable. The way the villa has been decorated and furnished was very good and you don't really notice that the villa is quite new but the benefit of proper fitting windows and shutters was a welcome. Panormos is perfect to appreciate Cretan life and cuisine - it helps being a working fishing village to keep it traditional but offers more than you need. The sea is accessible close to the villa (2 mins away) but some of the rocks are quite slippy. Just west of Rethymno there is a beach that is about 8 miles long with loads of space and tavernas dotted around. We would definitely recommend couples or families to stay here. Fantastic villa and very friendly service. Excellent holiday in a good well-appointed villa. Panormo is a pleasant village not too spoiled by tourism. Crete is lovely and the people and service were good wherever we went. We really had a good holiday, the holiday was lovely and we would recommend the villa to our family and friends. We adored the villa, it really is very well appointed. The garden area is fantastic and we loved the pool. Overall we liked our week very much. We were very impressed with the villa. If anything I think it was undersold on your website What impressed us most were lovely fresh white sheets, fluffy white towels, very clean, beautiful little touches like the bed-side lamps in the double room and attractive decoration everywhere. The garden was kept beautifully as was the pool. Great to have a maid come in half way through the holiday and change our sheets and towels. Overall we loved it. The villa was excellent and all the surroundigs very beautiful and peaceful. We enjoyed much the time we spent there. Driving instructions provided were excellent. Property was as described - good location, close to beach and village restaurants, shops and with wonderful views. The house was very clean on arrival. We appreciated the nice bed linen and lovely fluffy towels. The kitchen was well equipped with the added bonus of a wonderful garden with fragrant herbs. Shame we only discovered the hammock on our last day! This was an amazing vacation for our family. We spent one full week in Villa Liakada and enjoyed every second. 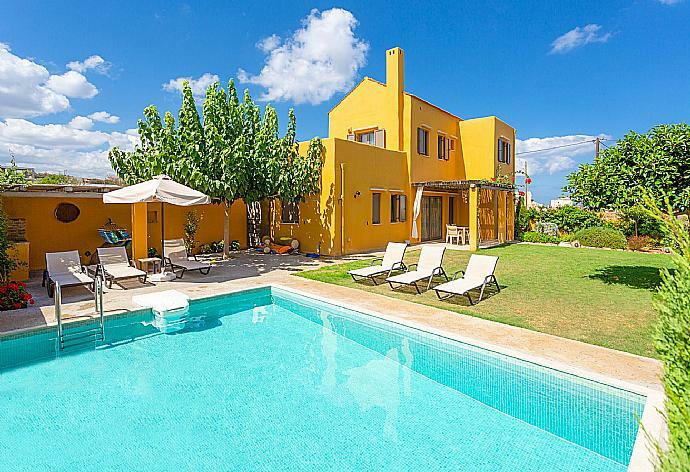 The Agni Travel Team was extremely professional and they worked with a sense of urgency for us to enjoy every second of our time.I would highly recommend this villa to anyone interested in visiting Crete. We were 5km from Bali Beach (2 best beach on island) and walking distance to small port area of Panormo which had plenty of restaurants sun beds and shops for everything. The beach outside the villa is accessible but not great for kids to swim (too many big rocks) but don't let that be the factor, the view was beautiful. We had an enjoyable time the view is very nice of the sea from most of the house and the outside table. Villa Liakada was booked 5 days ago!